Across much of the world Christmas is a cold time of year. The opposite is true in Australia. Christmas and the first few months of each year bring the hottest summer weather to Australia. What is a ‘hot’ Christmas like? Read on! Well, let’s start by not having to dig the car out of all the snow on the driveway and scrape the ice off the windscreen. That just doesn’t happen here. You’re unlikely to need your thermal undies either, although you may need more than a bikini if you’re celebrating in Tasmania. Turkey lurkey or toss another shrimp on the barbie? Is your favourite part of Christmas the Christmas dinner? Prepare yourself to not necessarily get turkey with all the trimmings while downunder. Turkeys are available and even sprouts (eurgh!) but many people cannot face the thought of spending half the day anxiously sweating over the oven when it is such a glorious (and usually hot) day. Many Aussies prefer to get out the barbecue and gather around that. Fresh seafood, steak and salad just suits the hot weather better. Lots of restaurants offer Christmas dinners in July in fact, when the weather is cooler. Christmas falls neatly at the height of mango season in Queensland and there are lots of other fantastic fruits available too. Christmas pudding, in this heat? It’s available but not my thing on a hot day. If you do get served it you will probably be offered rum butter, rather than brandy butter. Gorging yourself on fruit rather than chocolate certainly leaves you feeling less guilty (and fat!) afterwards. Hit the beach, with your surfboard, tra-la-la-la-la la-la-la-la! Christmas is as much a time for families to get together in Australia as it is in Europe and America. Many people spend the time visiting and catching up with relatives. Religion is significant to many people, especially in the smaller communities and Christmas services are often held. The beach is popular too but due to the danger of combining boozing and swimming, there are strict alcohol consumption rules. This bit really depends on who you are spending Christmas with and whether or not you have dropped enough hints! Australians generally like to support Australian enterprises and businesses, so, in my experience at least, are keen to give (foreigners) Australian made or themed gifts. 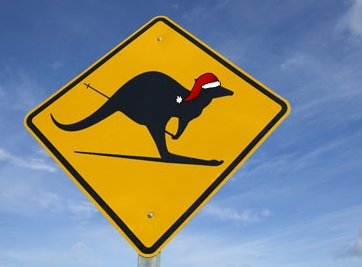 Amongst my favourite gifts over the years, I have been given ‘Australia’ calendars, a soft toy kangaroo, a koala hatpin, Australian made toiletries and a book about women living in the outback. I have not been given them myself, but I think the worst you might end up with are a bottle opener made out of kangaroo testicles (I wish I was joking) or a purse made out of a cane toad, face, forearms and all! I am hoping not to receive either of those this year, or to find a melted Terry’s chocolate orange in my stocking. Where have you experienced a ‘warm’ Christmas and did you enjoy it? How did it feel?